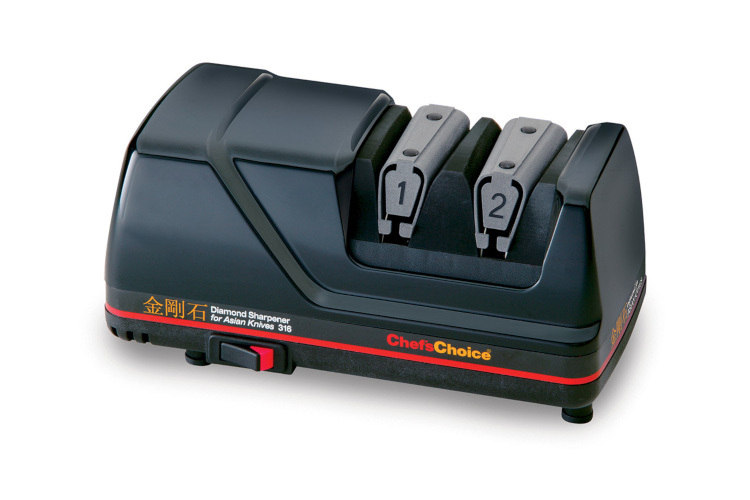 The Chef's Choice 316 is a professional grade electric knife sharpener which gives you a factory sharp edge for your Asian Style steel knives. It has two stage sharpening for stronger edges and faster results. The first stage is honing with a fine 100% diamond abrasive; the second stage is polishing with an ultra fine 100% diamond abrasive. The precision guides sharpen at 15 degrees (ideal for Asian style knives). Works for both single or double faceted blades. Available in Red and Black. Easy to clean and maintain. The Chef'sChoice 316 is a remarkable appliance that lets you sharpen your Asian style knives to a professional standard in your own home and have edges that will be extremely sharp as well as smooth and durable. Annually remove any metal dust that accumulates inside the sharpener by removing the small rectangular clean-out cover and brush off filings from the magnet with a paper towel, dry cloth or small brush. No lubrication is needed for any moving parts. There is no need for water on abrasives. The exterior of the sharpener may be cleaned by carefully wiping with a damp cloth. Do no immerse in water or other liquids or item will be ruined and not covered by any warranty.